Jim wants to know if Beverly's baby is his. Beverly tells Jim that it is his baby and he is the father, her relationship with Ewan is over and it never went far enough. Helen watches on from the kitchen and Beverly storms out. Helen comes in wondering how on earth Jim could have asked that and tells him he's like a bull in a china shop. Jim asks Helen if she believes Beverly, Helen says she does because Beverly would never lie about something like this. Jim agrees and calls himself an idiot. Melanie tells Chrissie and Matt about Roger and how he hopes to visit her soon. Mel leaves to go to work and Chrissie and Matt look at one another. Neither are convinced that Roger actually exists, particularly as Matt said that he hasn't seen any letters from him that Mel keeps talking about. They think that Mel has a difficult job trying to accept that perhaps her holiday romance ended. Chrissie says that from now on whenever Mel mentions Roger she's just going to change the subject. Mel shows Paul some figures on the hotel secretarial service. Paul has a look and thinks that they look very good. Paul asks after the roster, which Mel says, is looking good – there's always someone about and if not then there's her. Mel says the extra money is handy because Roger is due soon and she needs new clothes. Paul reminds Mel to not let it interfere with her regular work and then heads back into his office. Des is home from Perth and drops in. Both Paul and Mel are pleased to see him. Des tells Paul and Mel that he won't stop he just thought he'd pop in to say that he was back and that he has some good news to tell them later. Mel wants him to tell them now, but he tells her to wait until later. 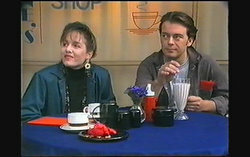 Paul and Des agree to meet up later at the Coffee Shop. 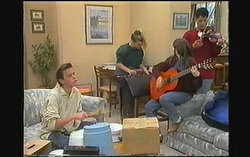 Cody and Melissa are singing a song that they've composed whilst Todd and Josh look on. They try and help them but the girls don't want them to steal their lyrics. The four of them decide to jam and as they start Beverly comes in telling them that that's enough and asks them to rehearse somewhere else. They agree to go to Jim's to drop their instruments off and then to Des's. Jim comes to visit and the kids leave to go over to his. He has come to apologise to Beverly. He explains that there was the night when she spent the night with Ewan, but Beverly said that he spent the night alone – on the sofa. Jim asks when the baby is due and Beverly tells him in a little over 6 months. Jim laughs – it was probably that weekend they spent together. Jim wants to try again – to make it right with her. Beverly says OK but she wants to go slowly. She reminds him of Caroline and Jim promises to sort it out. Caroline has come to talk to Chrissie – she's concerned about Jim because something isn't right and she thinks there might be something going on between him and Beverly again. Chrissie says that if she has thoughts that Jim wants Beverly back then she should end it before she gets hurt. Caroline says she's already hurt – it's good advice but she loves him. Des has set up the drum kit for Todd to look at. 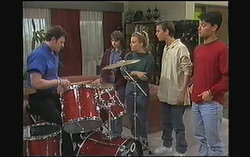 Cody reminds him that he should check with Beverly first as she didn't look too thrilled about having a drum kit! Des gives him some basic lessons in how to drum but ends up just drumming to himself, obviously having a good time. The girls and Josh leave and Kerry walks in – she compliments him on his drumming. Josh offers to go but Des tells him to stay for the afternoon. Kerry offers to keep Jamie at her place. It may soon be too late. With violence and with hate. And the hatred will all cease. And really make a stand. And take each other by the hand. Josh laughs because “it's unreal”. Jim comes to tell Caroline that he and Beverly want to get back together, Beverly is pregnant. Caroline says she understands that they have to make a go of it particularly with the baby. Jim tells her that he's been through a rough time lately but she's made it easier. Caroline tells him he's doing the right thing and tells him to save his marriage. Jim kisses her on the cheek, thanks her and tells her she's a good friend. Des asks Kerry if he can tell her some fantastic news. DES: Well, Jamie is gonna have a new mum. I met her in Perth, we fell in love and now we're getting married. Aww, Des gets a bit emotional about it all. Kerry is really interested and thinks it's fantastic news. She asks Des to tell her about all about the woman. She's called Fiona and has two kids, best of all though, Jamie really likes her. Des says the wedding is in a couple of months. Kerry is thrilled for Des and Jamie. Caroline hasn't made a phone call that she was supposed to and Paul isn't very impressed. He asks to see something but she can't find it. He gets up from his desk and tells her to get her head together. He picks up a folder and tells her these aren't the most recent figures. Caroline looks a bit unsure and Paul asks what's wrong – she looks like she's lost half her marbles. He shouts at her and she runs out crying saying that she's made a big mistake. She runs out past Mel and Chrissie, who has just walked in. Paul asks Chrissie what's wrong with Caroline because she just burst into tears and ran out. Chrissie goes to follow her. Chrissie has found Caroline and asks her what's happened. Caroline relays the story from earlier about Jim and Chrissie hugs her whilst Caroline cries. Caroline said she said all those things about fighting for him but when it came to it she just said it was OK and she let him go. She cries on Chrissie's shoulder asking what she's going to do. Des has told everyone about his wedding plans. He tells Mel, Paul and Matt that he won't be coming back – they have to remember that he was from Perth originally. He talks about selling the house and work so he's not sure when he'll make the eventual move. Matt asks if there'll be people going through the house and Des said there probably will be. Mel says that she and Roger were thinking about moving out together anyway, she goes home to see if he's called as she's expecting a surprise from him today. Matt tells Des and Paul about his and Chrissie's suspicions regarding Roger – is her real? Paul asks Des if he can talk some sense into Mel because she is driving him round the twist by keep going on about Roger. Cody and Melissa are singing their song to Helen. Matt joins in and Melissa gets annoyed – but Matt thinks it needs some help. They all comment on how they can't hear Todd drumming. And just like that he walks in saying he's found a new instrument as Des has turned him off drumming. It's the didgeridoo! Helen thinks it's an interesting idea, but can he play it. Todd gives it a go using circular breathing, the answer is no – he can't play it! Des is trying to subtly talk to Mel about Roger – she must have felt like she dreamt it! Des tries to bring up imaginary friends, saying he used to have one to which Mel agrees – she used to too! DES: When you get older you grow out of it. Except, erm, some people…especially if they're lonely…they still do it. Still have imaginary friends. Matt agrees, that sometimes lonely people get mixed up and confuse dreams with reality. Mel is looking very confused. There's a knock at the door and she goes to answer it. As she does she screams – she can't believe he'd be here so soon! She tells Des and Matt excitedly that it's Roger!